The Harbor Seal (Phoca vitulina), also known as the Common Seal or alternately spelled Harbour Seal, is a true seal found along temperate and Arctic marine coastlines of the Northern hemisphere. They are found in coastal waters of the northern Atlantic and Pacific Oceans as well as those of the Baltic and North Seas, making them the most wide-ranging of the pinnipeds (walruses, eared seals, and true seals)...Harbor seals are brown, tan, or gray, with distinctive V-shaped nostrils. An adult can attain a length of 1.85 meters (6.1 ft) and a mass of 132 kilograms (290 lbs). Females outlive males (30-35 years versus 20-25 years). 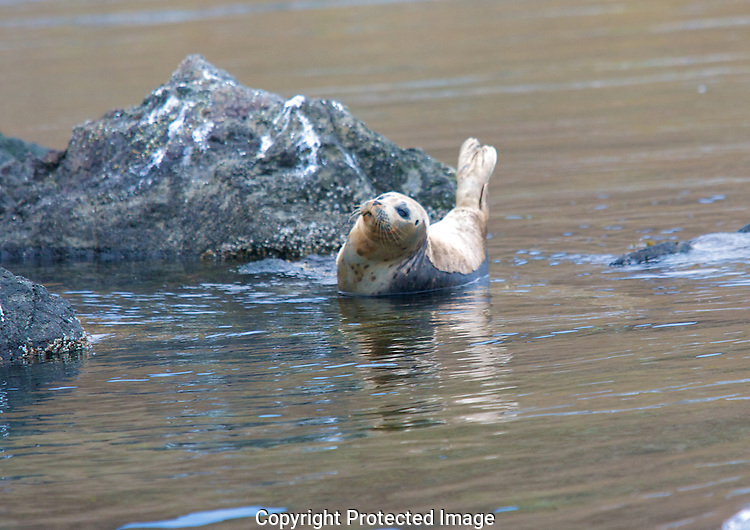 Harbor seals stick to familiar resting spots, generally rocky areas where land predators can't reach them, near a steady supply of fish to eat. Males fight over mates underwater. Females mate with the strongest males, then bear single pups, which they care for alone. Pups are able to swim and dive within hours of birth, and they grow quickly on their mothers' milk. A fatty tissue called "blubber" keeps them warm...Their global population is 400,000 to 500,000, and subspecies in certain habitats are threatened. Seal hunting, once a common practice, is now mostly illegal.